Wow, wow, WOW! These muffins are SO good. And so pretty! You’d never ever guess that this tall, fluffy muffin is completely gluten free. Yup. No gluten anywhere in sight! Now, I know that some people who are gluten intolerant have issues with oats. Obviously this is not the recipe for you, if you do (sorry! Maybe rice bran and buckwheat flour?). That said, if you can eat them, this is a super easy and filling breakfast bread. It contains eggs and butter, so it’s not low fat, but having real, nutritious food that I can digest properly is so much more important to me than having low fat food! This isn’t something I’d eat every morning, but it’s definitely a fantastic way to start the day! I usually use grams in my recipes, because I find them super easy to add, subtract, and divide. But I have to admit that I adapted this recipe from one I found in the book Ratio by Michael Ruhelman. It’s one of my favorite baking tools (it makes gluten free baking so much less of a headache!). I didn’t have the brain capacity this morning to change ounces to grams, so I just went with it. Hence, ounces. You could probably easily make the change yourself if you wanted to. Pour into super well-greased muffin tins (or muffin tins lined with cupcake liners). I’m warning you ahead of time – these stick. I’m not sure what it is about certain flours but some of them are more prone to sticking than others. Anyway, these do stick if you’re not incredibly careful! I fill my muffin tins almost completely, and these (amazingly) dome up just gorgeously instead of spreading out. This recipe really makes just over 12 muffins (either make another small muffin in another container, overfill, or toss the rest of the batter). Bake for 25-28 minutes in an oven preheated to 375 degrees. The tops won’t get very brown but the edges will, so be careful. These are light, fluffy, and oh so good. They’re slightly sweet and nothing like the heavy lumps of bran muffins I ate before I discovered I was gluten intolerant!!! It’s a day after I made these, and I had them again for breakfast. I just have one thing to add before I publish my post, but it’s something I think is awesome. These were just as good this morning. 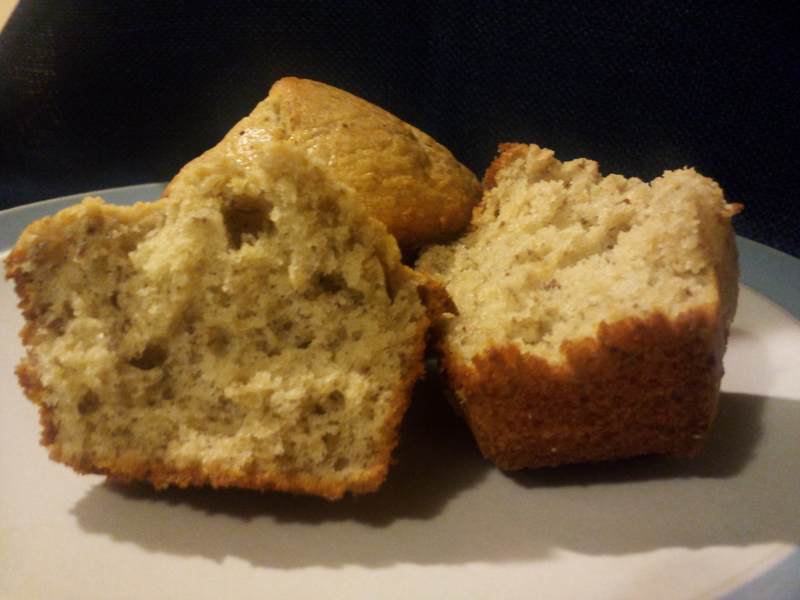 They’re fluffy, moist, and springy – NOT crumbly or grainy like gluten free breads often get. They didn’t need toasting this morning. Yup. You need to make these!!!! This entry was posted in Recipes and tagged baking powder, bran, breakfast, cream of tartar, flax seed, flour, fluffy, gluten free, gum free, light, moist, muffin, oat bran, oats, springy. Bookmark the permalink.